Abby Doorn was the rich founder of the Dutch Memorial Hospital, and she continued her interest in the hospital, its patients and its doctors. Now she was over seventy, diabetic, and very dead. She had come in in the morning to visit the charity ward, went into a diabetic coma, fell down the steps, and hurt herself seriously. She was to be operated on by Dr. Francis Janney who was believed to be the best surgeon in the hospital. When she was wheeled into the operating room for the surgery,she was already dead because someone had strangled her. 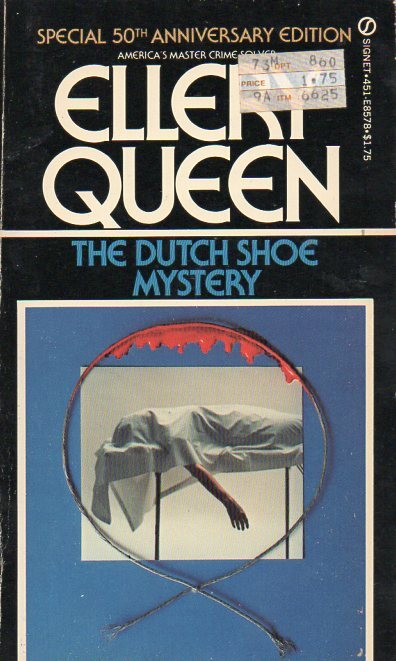 Ellery Queen was visiting the hospital that day with a question about another case for Doctor Minchin, but when it was know that Abby Doorn was dead, Ellery rapidly took over the investigation into her death. I was amazed at the way everybody in the hospital let this amateur investigator go looking around the operating room and questioning the members of the staff. He did not even wait for the police to arrive, but when the police did arrive they were accompanied by Ellery's father, Inspector Richard Queen who got things under control. Ellery's investigation led him to examine what motives the members of the hospital staff and of Abby's family could lead to her murder. Her large fortune would be divided between her daughter Hulda and a nephew who was off in some remote corner of the world. Abby had a companion, Sarah Fuller, and they were always arguing with each other. Sarah would receive a lifetime income from the will. There would be other bequests to the doctors on the staff. There was a research project conducted by Dr. Kneisel going on at the hospital which would seem to lead a very profitable result, but it seems to me that it had nothing to do with medicine. Abby Doorn had been financing it until just before her death when she had cut off the money. The problem here was not one of motive, but of opportunity. Who could have murdered Abby Doorn while she was in the hospital under the surveillance of doctors and nurses. Ellery feel that he is totally stumped in his search for the murderer - especially when another murder by strangulation occurs to a member of the hospital staff. But of course, all is solved in the end and Ellery gives a remarkably long explanation for his solution. I found this book interesting, but Ellery with his pince-nez and his chain smoking and his know-it-all attitude was a bit much. This book was published in 1931 and was the third Ellery Queen novel written by the cousins Frederick Dannay and Manfred Lee. I have read this book for the 2018 Just the Fact's Ma'am Challenge. 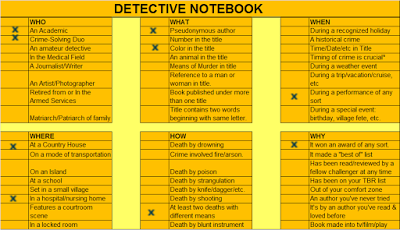 In my detective notebook, it will be entered in the category Where - in a hospital.